Found this recipe in a book (sorry I can't remember which book) that I purchased through a book club. Know the little boys and girls will have fun with these. Second... take out half of this mixture and put in your small bowl. Set aside the large bowl for later use. In the small bowl, add a few drops of your fragrant oils and a few drops of food coloring. Mix well. Third... take another 1/2 of the mixture and add it to your small bowl. Mist with water so it sticks together. DO NOT add to much or the mixture will fizz. Fourth... Use a small ice cream scoop to form soap balls. Be CAREFUL when shaping them. They will be fragile and may fall apart. Then transfer them to wax paper. Fifth... Get 1/2 c of the mixture from the large bowl and repeat steps 2-4 until you have used up all your dry mixture. 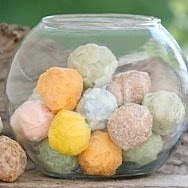 Six... Let your soap bombs dry for a minimum of 24 hours on the waxed paper. HAVE FUN MAKING THESE FUN EXPLODING SOAP BALLS. YOUR KIDS WILL LOVE DROPPING THEM IN THE BATH WATER. DON'T FORGET TO MAKE A VARIETY OF COLORS. Display them in a clear jar on the counter for easy access. Take them outside and let the kiddos make them fizz in puddles or buckets outside. I've tried these but they always fizzzz out while I'm making them, lol. Here from follow friday! I love, love, love craft blogs and your's rocks. My kids love bath bombs, been there made them. I am now a Friday Follower can't wait to be inspired by you. my kids would love these! Yeah. These are fun for the kids. Make great gifts too. Great idea by the way! i used to make these all of the time! Way better than those crappy ones you buy. Wow, really? Exploding??? Sounds super cool! Thanks for linking up at Friday Follow. I am already following and stopping over to say hello. Happy Friday Follow! Following you from the Friday Follow! Stopping by to say hello with Friday Follow. Stopping by to say hello. Thank you for joining the hop this week. This is great! I am from Friday Follow. How fun! Following from FF - and following on twitter. Join me and link up for Furry Friday Follow at My Pet Savings! Hello!! I'm following you from the Friday Follow. Happy Friday Follow! I am now following your blog! I would love for you to follow mine, too! These exploding soap balls sound so neat. I want to try making these. I am already following your blog. Happy Friday Follow. Friday Follow - Those are great! My boys like anything that explode! How cool! I have never made or owned anything like this! Going to have to try this! I think the boys will love it! Love these Thanks for joining this week and posting. I'm already following you. Sorry I have been around. I'm switching over to Wordpress so my blog is down. I'll be back soon though. From Friday Follow. Hello and have a great Friday. We love these and I never thought about trying to make them myself! TOTALLY in love with your blog. Thank goodness for FF! I am a big crafty person myself but you have a million ideas that I have never done! WOO HOO! I am following your from FF-come follow back please. Looking forward to reading your blog! Juiana from A Blonde Walks Into A Blog!